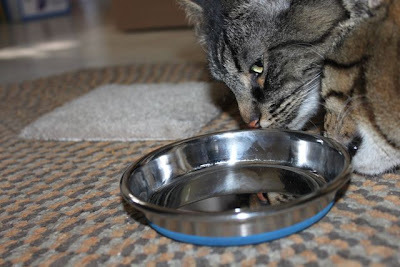 I did some shopping for the kitties yesterday and got some new kitty things. A new bowl for Willow. She prefers to eat off the floor rather than from a bowl. In the past she would take a mouthful of nuggets from the bowl and dump them on the floor and then eat them from the floor. So I used to use the little carpet square in the background as her food spot, but I got worried about not being able to clean it properly. I also didn't like that they would all spend loads of time just licking on it. I bought this shallow and wide bowl hoping she wouldn't think it of as much as a bowl. So far, it seems to work. New toy! 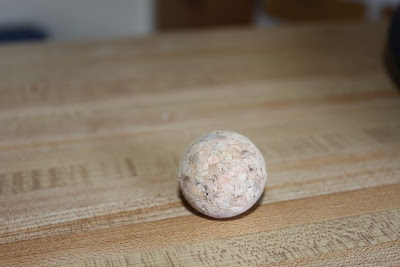 A cork ball. 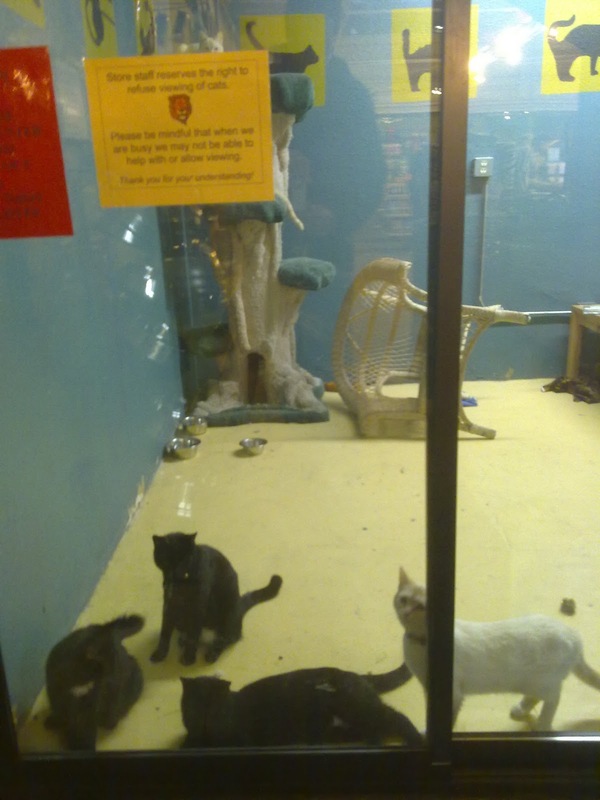 I always have to look over the kitty toys when I go into the kitty store. The cats certainly don't need any more toys, but it's fun to buy them new ones. This cork ball was cheap and I could see Rose having a good time with it. 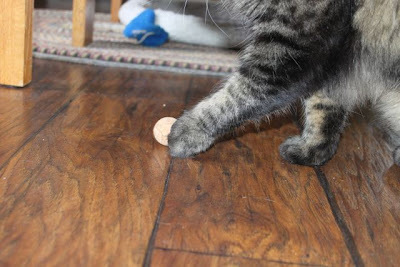 Since giving it to them, it has disappeared somewhere - so, some cat must have had a good time with it! The time had come to expand the litter box offerings. I was operating two jumbo litter boxes for four cats, one upstairs and one downstairs. Even though I was emptying them at least twice per day, sometimes more, they will get too full for my liking. The cats never complained about it, but I wanted to be proactive and prevent them from communicating their displeasure. I didn't do a scientific study but it seemed like the box was getting fuller, I wondered if it had to do with Rose transitioning from a kitten to a cat. 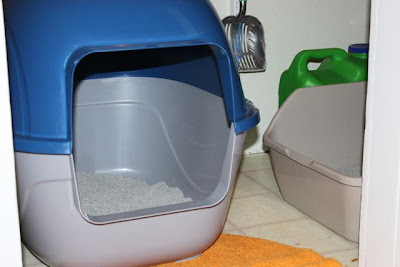 Anyways, it was time to add more litter box. The downstairs box saw the most traffic, so it was the obvious choice for expansion. Fitting another large litter box in the bathroom closet would be a challenge. I was looking at a nice corner model that was on clearance, but I finally decided it would be too small. I have made that mistake before - I attribute it to being in denial about Nahum's large size! So, I got another jumbo covered model like the one upstairs. Now the entire closet is filled with litter boxes. We didn't need that closet anyway, I am thankful the cats let us use the closet for as long as they did. The store I like shopping at for kitty supplies, Next to Nature, usually has a bunch of adoptable cats roaming around the store. On Wednesday, when I was there, they were all confined to their room because they get deliveries in the front door and they could escape. They all wanted out though! And of course I wanted to take them all home! 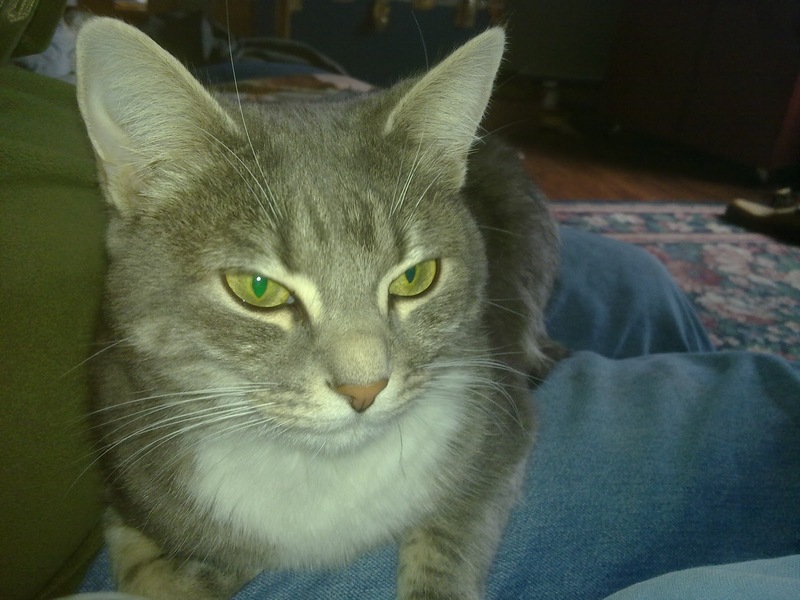 On a different note, Willow decided to celebrate yesterday's Willow Wednesday with a full afternoon of lap snuggles. Getting Willow laptime is still a rare and delightful treat. Hurrah for new toys and litter boxes! We have 3 boxes for the two of us (two in the basement and one on the upper level), and when Annie was still with us, we had 4 boxes -- 1 for each of us and a spare, even though we used all of them. The mom feels better too many than two few--as you understand! Haven't seen any cork balls, but mom gives us wine corks sometimes (she doesn't drink enough to make it a regular toy). 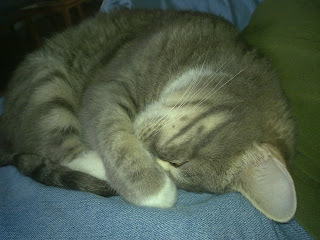 And the Willow snuggles looked wonderful. Willow is as beautiful as her name.